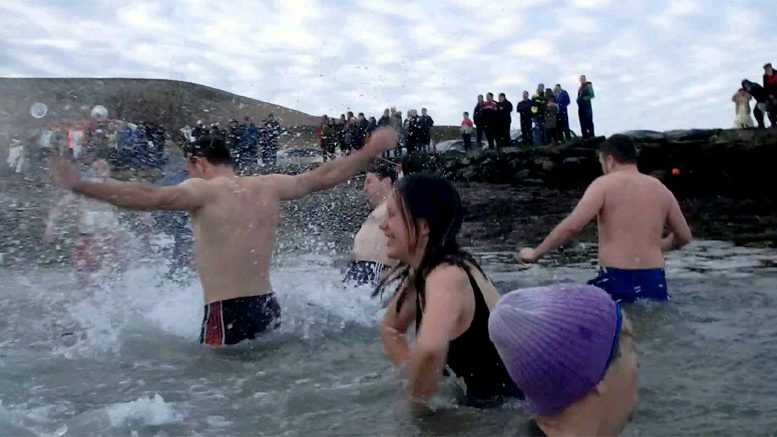 The Christmas day swim has been taking place in Ireland for over 40 years and has become a popular with thousands of people taking to the cold Irish waters. The Christmas swim is renowned for its fund raising for charities with each event nominating the proceeds to their own worthy charity. Mostly held in coastal areas the Christmas day swim is however held in rivers and some of the loughs although its advisble to only attend a well orgainsed swim. With the risks involved from swimming in the cold water most organisers will notify the local Coast Guard and the Garda ahead of the event. Strict rules are usual set in place for the safety of participants. Never mind swimming cold water, standing out on Christmas day in Ireland is cold enough. It’s a must to bring along plenty of warm clothing and you can never have enough. Some organisers will provide hot beverages and Christmas mince pies but if a tipple is a must for the Christmas Day swim it should only be taken afterwards. It’s always a good idea to make up your own flask of hot tea, coffee, or even soup. As aside from the clothing to wear when out of the water, what to wear going into the water is equally important. Swimmers don’t want to wear any type of clothing that becomes heavy when wet, like woolly jumper. Proper swimwear is usually the best choice on what to wear for the Christmas swim although some events do require participants to wear sponsored charity t-shirts and such. Some events will have more than just the mad dash to the water, in places races will occur between the more experienced swimmers. The start times for the traditional Christmas swim vary for each location, some will start 9am and others later. Participating in the annual Christmas swim is extremely dangerous due to the risk of cold shock that can result in lethal shock responses and kill within a matter of minutes. Well organised events will have emergency services on standby for the swim but participants are usually advised to pour a handful of water down their back before jumping in and to get out of the water as quickly as possible. The Christmas day swim is fun for all the family and with many Irish people making sure its part of their Irish Christmas celebrations every year.